There are all kinds of men, from many walks of life with varied interests, and it makes me happy to see one group get more and more respect for their talents and contributions - namely the nerd. From shows like Big Bang Theory to the popularity of comic movies and even nerd music, the intellectual man has arisen as a popular clique. One area that they still aren't known for contributing to is charity - and this is wrong - for as I see it geeks and nerds give as much if not more than other groups. But hopefully that is changing as well, as you can find many stories here of nerds doing good. Joining in other campaigns such as Child's Play (providing toys and games to childrens' hospitals) and the Call of Duty Endowment (for veterans) Blizzard Entertainment, creator of the Warcraft and Starcraft universes among other well-known games, have helped pave the way for gamers to be charitable with in-game purchases that they donate the proceeds from to a charity. For this holiday season, and with the launch of their new expansion for World of Warcraft: Warlords of Draenor, Bizzard once again has setup a way to donate, and get something in return. This year players can purchase an in-game pet. 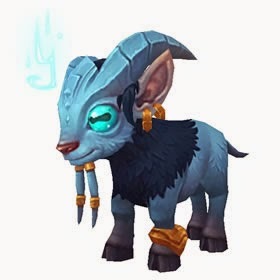 Available December 3 in the the Battle.net Shop: Argi is apparently a Talbuk fawn (if that's what you call a baby talbuk - a fantastical deer-like creature). For every Argi pet purchased between December 3 and December 31, 100% of the adoption fee ($10 in the U.S.; pricing varies by region) will be donated in support of the American Red Cross to assist in Ebola relief efforts, helping enable the Red Cross to provide assistance to those in need. So, if you play WoW, or know someone who does, you can buy this pet for yourself or others and at the same time support the Red Cross and their Ebola relief efforts.